While working in one of the apiaries recently, I had discovered a nest of the native Golden Paper Wasp, Polistes aurifer, underneath some empty bee equipment. There were two or three workers and the queen who was unwilling to leave. While I had my beekeeping veil on, I decided to get some photos. I question whether or not I even needed a veil since there were no signs of aggression. The workers simply fled while the poor queen was left with her brood. Although paper wasps and other social wasps have the reputation for being aggressive, this species (and perhaps the entire genus, ~19 species) and the related Mischocyttarus is relatively gentle and nonaggressive. One key difference I have observed is that the colonies of P. aurifer remain relatively small and may have up to 300 cells per nest and comparatively few individuals. I have personally not seen a nest larger than my fist. For comparison, honeybee colonies can have upwards of 100,000 cells and 50,000 individuals in a hive. 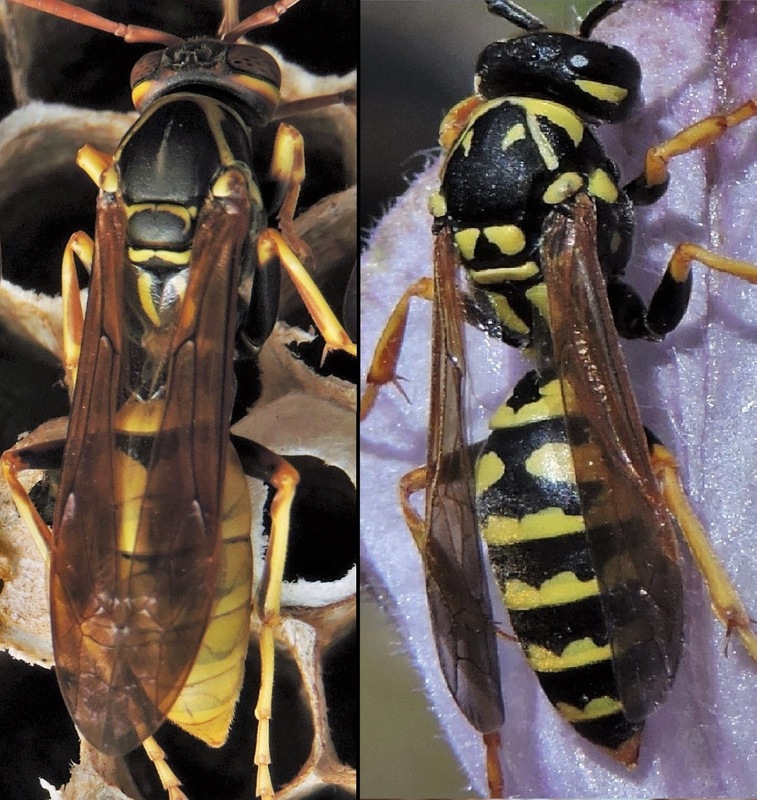 Bald faced hornets (Dolichovespula maculata) and other aerial yellowjackets build nests the size of a large watermelon with 700+ individuals while true hornets (genera Vespa) build nests in similar proportions. Yellowjackets in the genus Vespula can have underground or otherwise sheltered colonies that attain massive size with over 15,000 cells and several thousand individuals. Dolichovespula, Vespa, and Vespula are much more numerous, defensive, and potentially aggressive than Mischocyttarus and Polistes. A common European invader to much of the United States, the European paper wasp (Polistes dominula, pictured above on the right) has nests that look nearly identical to the nests of P. aurifer except for occasionally attaining nest sizes similar to bald faced hornets (Dolichovespula maculata). This species is slightly more aggressive, and often shares habitat with P. aurifer (which in my case is under the eves of my roof). They can be told apart by their patterns, higher contrasting patterns of P. dominula while the abdomen of P. aurifer is mostly a dull yellow. I would also like to add the observation that the antennae differ in color, P. aurifer antennae fade to black at the ends while P. dominula antennae are black at the base. Markings on the thorax of Polistes dominula are also diagnostic. Males lack stingers, like all other male Hymenoptera, and are produced towards the end of summer or the beginning of fall. They will mate with new females and die. Newly mated females will hibernate in a protected location through winter and build new nests in the spring, sometimes competing with other females over who will be the dominant layer. This appears to result in lost limbs of laying females, a consequence of retaining genetic superiority. Polistes aurifer nests are made of plant fibers and wood pulp, so in other words, paper. Wasps as we know them first appeared in the Jurassic and social wasps appearing in amber sometime around the Upper Cretaceous period. The main diet of Polistes and other vespid wasps (Vespidae) is comprised of chewed up caterpillars for their developing larvae and either nectar or honeydew (the excrement of aphids and other sap sucking insects) for adults. Bees, in contrast, procure protein for their young from pollen while vespid wasps in general attain protein from other insects and can fairly be called predatory. This trait can be very beneficial in a garden where caterpillars are a problem. Eggs of Polistes aurifer are larger than honeybee eggs and more elliptical. Also note that the eggs of this species are towards the inner side of the cell, honeybees in contrast are always in the center of the bottom of the cell. It takes roughly 60 days for a mature P. aurifer to emerge, around 20 days each in the thee stages of development: egg, larvae, pupae. Honeybees, in contrast, take only 16 (queen), 22 (worker), or 24 (drone) days to emerge as adults. When I was watching this creature, I did not see an aggressive pest, but rather a mother guarding her young. When I first learned about this species, I thought twice about thoughtlessly spraying the nests in my eves or elsewhere. Had anyone been stung? No. I was just following the status quo and not considering my impact. By indiscriminately killing native wasps or other insects, I could be seriously disrupting the natural balance, and it just may manifest itself into a pest infestation in my garden or other unforeseen issues. Aside from all the pest control services these insects provide, they are also prey themselves to birds and likely other creatures in the food web. Why mess with something I do not fully understand, and why do it without fully considering the consequences? Why poison the native (and did I mention free?) pest control service providers? So I urge you to reconsider what you know and to ask yourself if you really know enough. I suspect as a species we do not know enough about the natural world as it is nor do we know the full consequences of our tactics. It's worth considering. We need more folks like you in this world who are making a difference by educating people on the beneficial aspects of wasps instead of shamelessly killing as many as possible. Please keep up the excellent work! :-) Thank you. Thanks for this post! I had European paper wasps in my yard (had to get rid of them because they were building a nest right by my gate and stung my husband, sadly) and I really wanted to know whether they were native or not. Your close-up comparison photos let me do that. Cool.